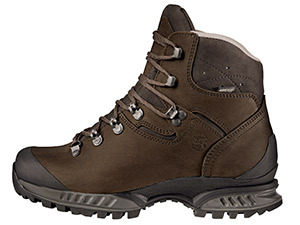 Good technical shoes are a deal-breaker when it comes to hiking, trekking and hillwalking. Proper walking shoes or hiking boots prevent blistering and foot pain. These problems can show up unexpectedly on hiking and climbing tours. If a walking boot doesn't fit, it's sure to cause pain and frustration. Hiking and mountaineering are more about savoring the outdoor experience and the world of the mountains. It beats trudging around in painful hiking shoes on an agonizing climb to the summit. Proper hiking boots and walking shoes make it much easier to reel in kilometers and climbing altitude. Special hiking and walking shoes for women are available on the outdoor market. With anatomically-suited walking boots, women who love hiking, nature, and the outdoors will come home with unforgettable mountain experiences instead of blisters and foot pain. Women have narrower feet by nature, this is reflected in trekking shoes and hiking boots. Women's models are fitted to a narrower shoe last that matches their anatomy. Men have wider and longer feet. When choosing walking boots and hiking shoes, they can rely on wider lasts and bigger sizes. 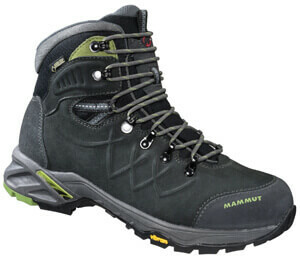 Walking shoes and hiking boots should meet the demands of hiking and alpine mountain tours. There are a few characteristics that good hiking boots must have. Like with walking boots, the shaft should reach above the ankles. Ankle-high shafts protect hikers and mountaineers from undesirable twists and impacts to the ankle joint. Technical hiking boots must be waterproof and breathable. They are mainly used in alpine terrain where the wind and weather can turn unfavorable. A waterproof and breathable Gore-Tex membrane blocks moisture and keeps your feet dry. This material comes on the outside of trekking shoes. Vibram soles with a deep profile are resistant to slips and abrasion. They provide necessary support on moist mountain pastures, slippery rocks, and in mud. If your hiking shoes or walking boots meet these criteria, then they're perfect for your next outdoor adventure. Nothing will stand in the way of a successful climb to the summit! Modern walking boots aren't the heavy, bulky hunks of leather they were in the past. Shoemaking innovations have led to robust, stable, and sure-footed walking boots that are nonetheless lightweight. Fit is still the most important thing. You could have the priciest and most masterful mountaineering boots out there. But if they don't fit, they simply can't satisfy their purpose. Many sporting goods manufacturers are aware of this. They provide various last widths and extra-large sizes. It's better for hiking boots and walking shoes to be a bit loose than too tight. Finally, you should assume that your feet will swell up after several hours of hiking, climbing, and heat. You might be eager to test your new hiking boots. Maybe you'd like to go on a serious hike or an alpine tour. But before any of that, it's important to break in your walking boots. Hiking and trekking shoes will feel right after a thorough run, particularly in mixed terrain. Finally, you've found the right hiking shoes and you've taken some time to break them in. Now nothing will stand between you and a fantastic mountaineering experience!